The promotional photographs for Relational Aesthetics, Jessica Stockholder’s show at The Contemporary Austin at the Jones Center, share some compelling features with the works themselves — they confuse the eye. It’s no accident. “I don’t think in volume,” Stockholder says, “I think graphically.” The sculptures themselves are described not as installations, but as three-dimensional paintings, or in some cases, “situations.” Stockholder’s propensity for working from a graphic, two-dimensional idea creates an interesting life cycle to the work, which transitions repeatedly from two-dimensional thought experiment to a three-dimensional model from which a full-scale work is rendered, and then to documentation photographs. In most instances this last phase might feel like convention, or bureaucratic necessity, but with these works, one wonders if the resulting images are actually nearer the artist’s original impulse than the structures themselves. Or perhaps it’s just another iteration of a persistent theme in Stockholder’s work — every element’s success is dependent on another element. Stockholder routinely manipulates a viewer’s perception of space though materiality and composition, and refers to many of her works in Relational Aesthetics as “assists.” These forms range from bundles of sticks to unwieldy sheets of metal that appear to be waving in the wind, or heavy-gauge metal screens supporting miniature works of art by other artists. Each of these assists are in turn supported by a prop, which is strange reversal of expectation — or is it function, or is it semantics? 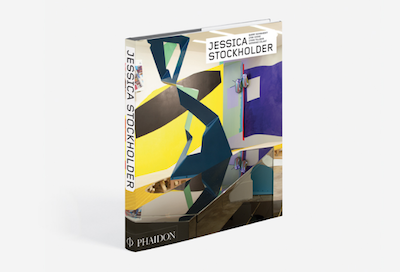 Phaidon is re-releasing Jessica Stockholder's monograph, as a revised and expanded edition. This title will begin to ship 11 June, 2018. Pre-order here. 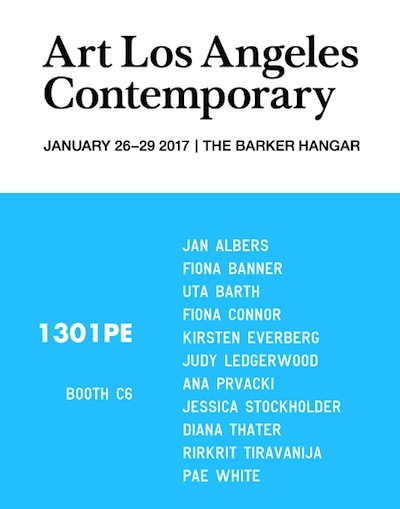 Contributions have been made by the following authors: Germano Celant, Lynne Cooke, Barry Schwabsky, Jessica Stockholder, and Lynne Tillman. Germano Celant is an internationally acclaimed author and curator acknowledged for his theories on Arte Povera. Lynne Cook is the Senior Curator, Special Projects in Modern Art, at the National Gallery of Art in Washington DC. Barry Schwabsky writes regularly for Artforum. He is currently Visiting Lecturer at Goldsmiths' College in London. 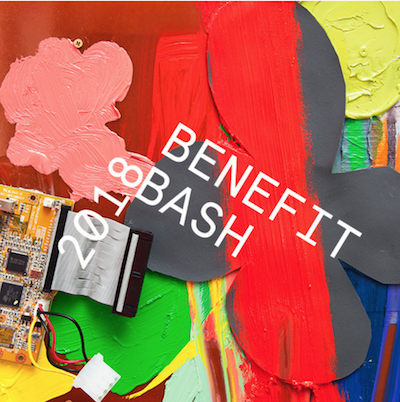 Jessica Stockholder is an artist based in Chicago where she is Distinguished Service Professor, and Chair of the Visual Department at the University of Chicago. Lynne Tillman is a novelist, short story writer, and cultural critic. Jessica Stockholder, Chicago, "Assist #1", 2015. Painted metal, ratchet clamp with yellow webbing and felt, 74 by 90 by 48 in. 1301PE is proud to recognize its artist, Jessica Stockholder, as one of the newest member of the American Academy of Arts and Sciences, class of 2018. As part of the American Academy of Arts and Sciences' commitment to recognizing and celebrating excellence, 213 individuals in a wide range of disciplines and professions have been elected as members of the Class of 2018. Founded in 1780, the Academy honors exceptional scholars, leaders, artists, and innovators and engages them in sharing knowledge and addressing challenges facing the world. The new members of the Academy were elected in 25 categories and are affiliated with 125 institutions. "Membership in the Academy is not only an honor, but also an opportunity and a responsibility," said Jonathan Fanton, President of the American Academy. "Members can be inspired and engaged by connecting with one another and through Academy projects dedicated to the common good. The intellect, creativity, and commitment of the 2018 Class will enrich the work of the Academy and the world in which we live." 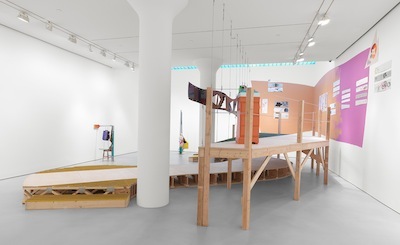 Jessica Stockholder's sprawling constructions have played a crucial role in expanding the dialogue between sculpture and painting and form and space. Within her work, the artist merges seemingly disparate, everyday objects to create holistic, colorful installations. Blurring the boundaries between painting, sculpture and architecture, Stockholder's current exhibition at Mitchell-Innes & Nash emphasises process, form, and, above all, gravity. This is apparent in installations such as Sale A Way or Security Detail that feature slouched and hanging components. However, the force is most integral to the artist's ongoing series of Assists – sculptures that cannot stand upright without the support of a given 'base'. Assist: Smoke and Mirrors, for instance – comprised of a web of copper wire, tarp and hardware parts – is buttressed by an upholstered chair; in a future iteration, it may instead come to lean on another sculpture or object. In the Assists, each component's mass, orientation and weight affect the stability of adjacent elements. Such works, perhaps, reflect the possibilities of both vulnerability and mutual dependence within our personal and civic lives. 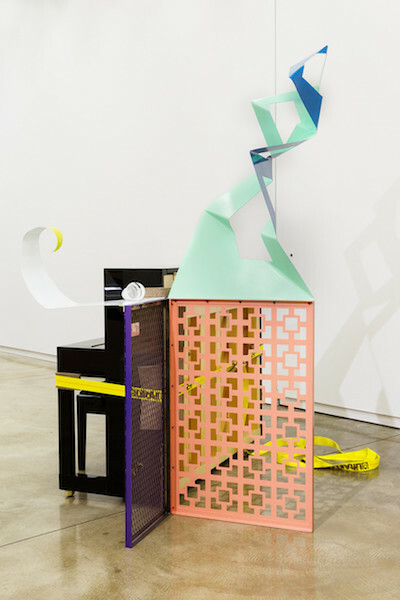 An installation view of Jessica Stockholder's show at Mitchell-Innes & Nash. 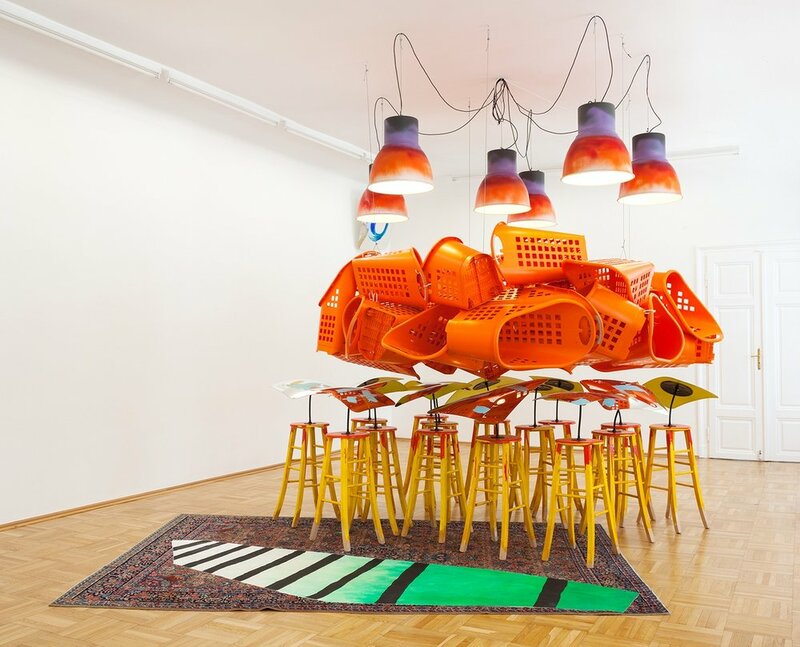 Jessica Stockholder's colorful assemblages of diverse store-bought and found objects call to mind a term from neuroscience, "multisensory binding." The phrase refers to the fact that the outer world appears to us seamlessly coherent, despite the many sensory signals streaming in from diverse sources — eyes, ears, nose, tongue and skin. Usually we don't notice how the mind binds together these different inputs. In Ms. Stockholder's engaging, if not wildly exciting, show of sculptures at Mitchell-Innes & Nash, your awareness of your attention's shifting between the disparate parts and the whole composition is essential. 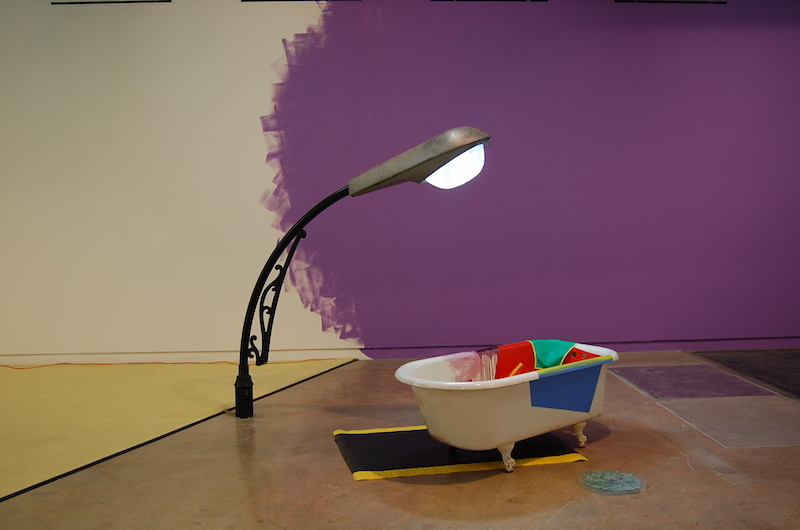 Jessica Stockholder's work is difficult to talk about because it eschews so many of the typical classifications we use to discuss contemporary art: "installation," "site-specific," "ephemeral." Indeed, that's one of the most central elements of her practice: the dissolving of boundaries. Finally the show's central work, the eponymous "The Guests All Crowded Into the Dining Room," features a large, winding, wooden stage connected to an elevated deck gallery-goers are encouraged to walk onto. Part sculpture, part viewing platform, part pedestal, it's easy to love, but hard to explain why. While the installation was wrapping up in the gallery, Stockholder sat down with Artinfo to talk about the show and some of the larger themes that run throughout all her work. Installation view at Mitchell-Innes & Nash, NY, 2016. Photo: Adam Reich. The Guests All Crowded Into the Dining Room will feature works from several facets of Stockholder's practice, including a large-scale site-responsive installation in addition to distinct bodies of studio works. This will be the gallery's third solo exhibition with the artist. Color Jam Houston treats the intersection of Main and McKinney as a single public canvas. The stripes of color on the four corners seem to be woven together and present a kind of basket. The weaving of different stripes together into a single whole is resonant with the reality of different owners, jurisdictions and codes that govern this section of public space consisting of crosswalk, roadway, sidewalk, store fronts and Metro platform. The work also signifies the delicate social and political balance that exists between individual rights, freedoms, responsibilities and our collective well-being and coexistence.